Cisco CEO, John Chambers, has a leadership view that disperses leadership decisions across organizations. Instead of “command and control,” Mr. Chambers spoke of a corporate landscape in which large companies had smaller decision-making management and boards. Each board could have interchangeable leaders from various backgrounds and could operate with some autonomy to decision making. He mentioned that within Cisco some 70% of the management process is performed this way. These flatter business models were able to negotiate several acquisitions and mergers that the company would not have otherwise been able to handle simultaneously. This was the primary way, in his view, that a large company stays competitive and nimble. 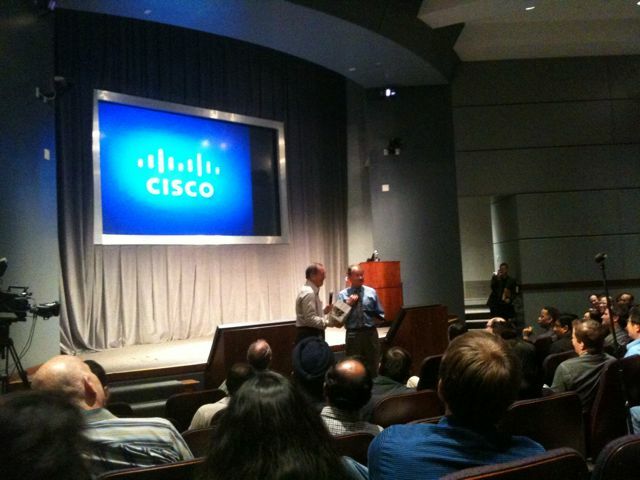 He must be doing somehing right, he has received countless awards both within and outside of Cisco. He has been the recipient of countless best company to work for awards as well as a recopent of many philanthropic awards. In order to stay innovative, his strategy is to get early or acquire and he was adamant about not getting into any venture if his company wouldn’t dominate. All ventures should be tied to core competencies or at least evolve the strategy to combine as was his current project to bridge video into networking.